Baby Boy is doing just great. He's a biggun, upwards of 90% on all the scans over the past month or two. 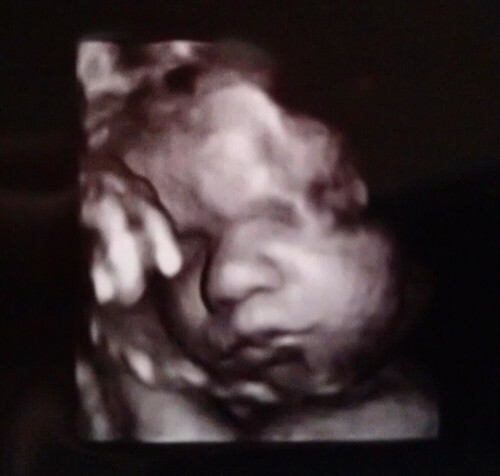 Right now, as we hit the 31 week mark tomorrow, he should be upwards of 4 lbs. He's supremely active - reminding me a lot of Caroline - and has flipped from head-down to breech FOUR TIMES in the past month. The girls love to gather around and watch my belly roil and tumble. The sensation is not always enjoyable for me, but it's such a huge affirmation that he's healthy and thriving. We're going to the OB and the MFM once a week, staggered, so that we have two appointments each week. My cervix has held steady at 18mm, which is the most encouraging sign of all. Being at home has been life-altering. My stress level has gone way down and my quality of life has gone way up. There are still stress points, though. Two big ones that I won't be able to discuss for a while, and some other more minor ones that are far easier to deal with. I have learned, though, that my stress level has a MUCH bigger impact on me physiologically than I ever would have thought. A stressful day almost always leads to spotting and more uterine irritability and contractions. The correlation has been undeniable. So we're working hard to sheild me from any unnecessary stressors, and to find good tools for dealing with the stress I cannot avoid. By and large, it's working. It's hard to believe that when I was first admitted to the hospital, we didn't think we'd make it out of February. Now, it's practically April! We are so relieved to have had all this extra time to keep him safe and cooking. Strictly by the numbers, women like me who were sub 15mm and "sympotomatic" (meaning they had preterm labor) would deliver their baby within 1 week 70% of the time. Here's to going against the odds - yet again!